Some of our most lavish and memorable party ideas have been to celebrate 50th birthdays. Huge creativity and seamless production create outstanding parties that not only thrill guests, but also deliver truly memorable celebrations. Deliver festival fun with lots of acts and entertainment to occupy guests. We got this summer festival themed 50th birthday party started with champagne, Pimms and strawberries accompanied by an unconventional string quartet playing rock music, jugglers and a deceptionist. Children had Victorian stall games and an arts and crafts tent. Teenagers were occupied with an Xbox games tent. Dinner and dancing to a Jazz and Salsa band was accompanied by Salsa dancers. Fireworks, accompanied by the best summer party tunes added drama to deliver a truly memorable experience. 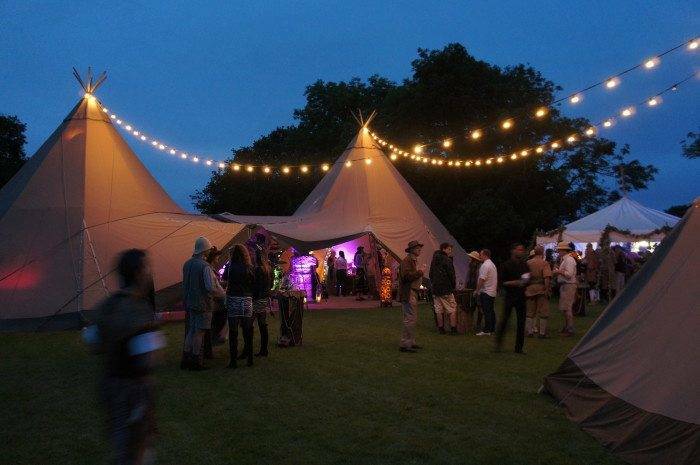 We accommodated guests onsite in tepees arranged around a large fire pit. Breakfast was served the following morning in the festival village. Spectacular. See more photos from this summer festival themed 50th birthday party. A night of decadent splendour and indulgence celebrated in grand style. For this 50th birthday party theme, reference the Baz Luhrmann Hollywood blockbuster production staring Leonardo DiCaprio for lush 1920s styling. This Great Gatsby themed party was pure theatre taking guests from a 1920’s New York China Town street scene through to a grand staircase leading to the Gatsby mansion. Catering was street style with chefs cooking in full view of their audience. Gatsby girls greeted guests and the iconic saxophonist played atmospheric tunes whilst the guests socialised and discovered dens of iniquity and speakeasy cabaret corners. A flash mob routine post dinner encouraged guests through to a spectacular ballroom with Charleston displays and dancing to the best party band in the UK. The venue was an industrial barn, and everything was brought in and installed, transforming a cold dank warehouse into an opulent Gatsby Mansion. See more photos for 1920s Gatsby inspired 50th birthday party theme. 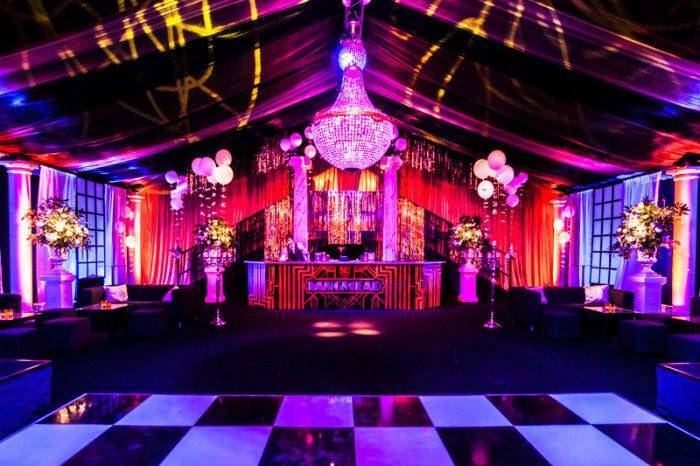 Our burlesque party set the bar high and pushed the envelope for entertainment, design and production. The evening was an assault on the senses with a full schedule of burlesque acts; hostesses, champagne serving martini glass girl, candle wax acts, burlesque dance troop, pole dancers, podium dancers, shot girls and photo girls. As guests arrived a DJ played ambient tracks while champagne was poured by a dancer in a giant Martini glass. After guests were shown to their seats for a sumptuous dinner, our stunning dancers performed Burlesque. They are incredibly talented dancers and always know how to work the crowd. With seamless transition, pole dancers and a candlewax Burlesque show more than entertained. Take a look at more photos for Burlesque themed 50th birthday party ideas. 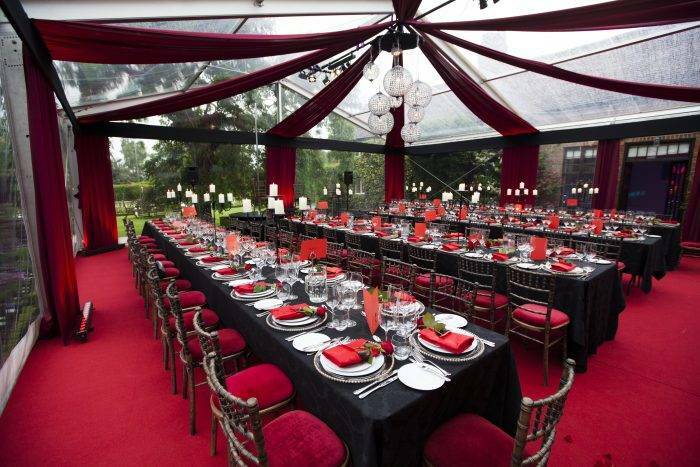 Using a stretch tent in a back garden, and a colour palette from images of Cuban architecture we created a sumptuous smoky Havana club for this 50th birthday party theme. We lined the roof of the structure with a unique red breakup lining giving it huge potential for creative lighting. Cuban cocktails were served and the catering also had a Cuban theme. The party entertainment matched carefully to the party style. guests arrived to a Latin guitarist while canapes were served. Salsa dancers then kicked off with a demonstration on the dance floor. At the end of their display party guests were on the dance floor learning the Salsa. A ten-piece band played a wide range of Funk and Soul tunes tailored to the Havana Nights theme with. A spectacular night of Cuban entertainment! See more photos from this Havana Nights 50th birthday party theme. 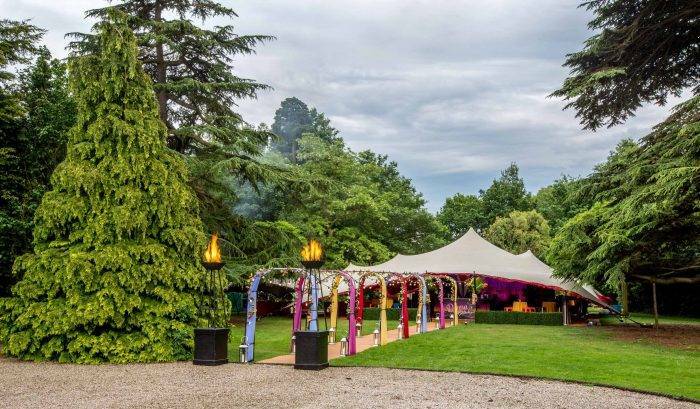 Our client wanted a unique tipi styled party with an African theme for her husband’s 50th birthday. 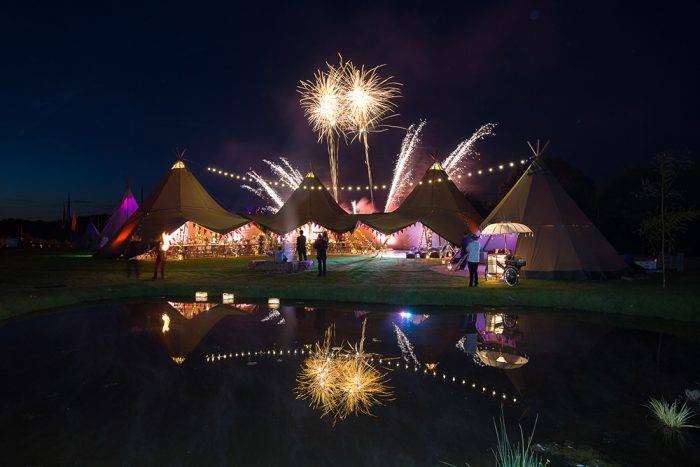 Party tents were arranged in a circle with a fire pit in the centre and linked together with strings of festoon lighting. The atmosphere was magical. Beautiful fire performers and authentic African tribal dancing and music entertained. Guests were treated to a superb high end BBQ. A memorable firework display over their lake was a highlight, before dancing to dawn to the DJs mix. A club drummer playing LED bongos accompanied the DJ. Take a look at more photos from this African inspired 50th birthday party theme. Do you have an 50th birthday approaching? Planning a party for a loved one? With more than 25 years’ experience Mirage Parties has gained a reputation for meticulous attention to detail and immense creativity. From conception to clear-up, we’re there every step of the way. Read more about our 50th birthday party planning and event management services.